The Dividist Papers: Can we do tax reform and immigration reform in an election year with a divided government and a lame duck president? Can we do tax reform and immigration reform in an election year with a divided government and a lame duck president? Why Yes! Yes We Can! We could do it in 1986, and maybe in 1998, but not in 2014. That's the thesis of John Harwood's article in the New York Times: "When a 2nd-Term President and a Divided Congress Made Magic". "In 1986, President Ronald Reagan sat in the White House. Fellow Republicans controlled the Senate but not the House — a mirror image of the alignment President Obama governs with today. That September, strong bipartisan majorities in both houses of Congress passed a drastic revision of the tax code that eliminated valuable tax breaks while lowering the top rate to 28 percent from 50 percent. The following month, less than three weeks before Election Day, bipartisan majorities transformed the federal immigration code as well, with amnesty for some already in the United States, penalties for businesses hiring illegal immigrants, and more money for border enforcement... All of them accepted two stipulations that, by narrowing the range of disputes, made getting to yes easier. They agreed that the new tax code would raise the same amount of money as the old one (making it “revenue neutral”), and that it would get that money from the same groups of earners (making it “distributionally neutral” as well)." A good article, but I think Harwood missed a couple of points. President Reagan prioritized doing a deal ahead of ideological or partisan concerns. Don't get me wrong. Reagan was a partisan and an ideologue. But he made doing deals a priority and was willing to suffer the slings and arrows from his own party to get a deal done. As Harwood points out in the article "Republicans like Phil Gramm of Texas... called granting permanent residency to some immigrants who had crossed the border illegally “outrageous.” Nevertheless, Reagan got the immigration bill passed. We learned from Bob Woodward's "The Price of Politics" that when faced with the choice of doing a deal or caving to the ideological pressures of his own party, Obama will forego the deal. "Woodward places particular blame for the failure to reach a deal with Obama, writing that the seeds of discord were planted early in his administration. He displayed "two sides" of his personality in early meetings with congressional leaders, Woodward said. 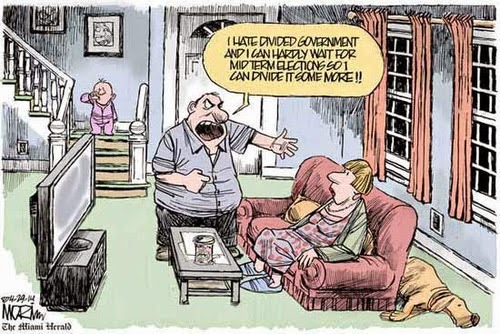 "There's this divided-man quality to President Obama always. Initially he meets with the congressional leaders, he says you know, 'We're going to be accommodating, we're going to listen, we're going to talk, we're going to compromise," Woodward said. "But then they -- Republicans ask some questions and challenge him a little bit and he says, 'Look I won. I'm in charge here,' " Woodward continued. "And the Republicans feel totally isolated and ostracized. And this was the beginning of a war." Bill Clinton shared this trait with Reagan. He was willing to bend and he was willing to buck his own party. It might be temperament or it might be ideology, but Obama will not bend as far as Ronald Reagan did to get a deal done, and he will not buck his party in the service of a compromise as Bill Clinton was willing to do. Harwood missed another factor that made it easier for both Reagan and Clinton to push a deal through a divided congress. In the Reagan and Clinton eras legislative ideological opposition could be softened through the widespread practice of sweetening deals with earmarks secretly carved out in committee. Lets' call it what it was - a form of legalized bribery to buy votes by throwing money to a district or big contributor. It was slimy. It was corrupt as hell. But it was sure effective in greasing the legislative skids and blunting ideological opposition. It still happens, but not to the degree that it did in the Reagan and Clinton years. The loss of that tool makes the job harder for Obama. Regardless, if the question is where does responsibility lie for getting deals done in a divided government? The answer is that the buck stops in the Oval Office. Full stop. 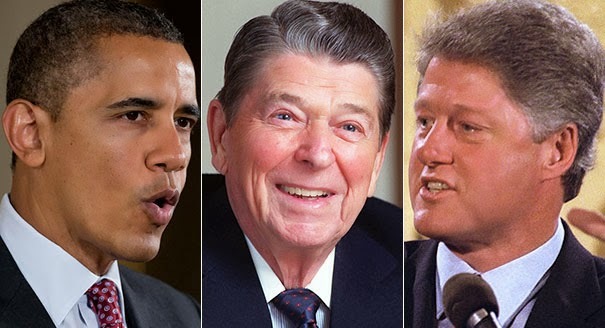 The lessons of Reagan and Clinton are clear. The way for a president to do big things in a divided government is not to stand firm against the opposing party. 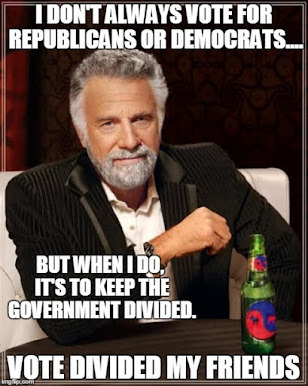 The way for a president to do big things in a divided government is to stand firm against his/her own party.